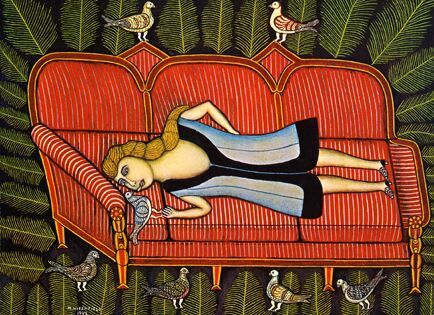 Morris Hirshfield was born in a small Polish town near what was then the German border. As a young boy, his artistic ability was recognized when he created an impressive sculpture for his synagogue. He immigrated to the United States when he was eighteen, settled in New York City, and found employment with a factory that manufactured women’s coats. After several years as a laborer, he and his brother started their own business, producing first coats and later slippers. They became one of the most successful slipper manufacturers in New York, but poor health forced Hirshfield to retire in 1935. It was then that he turned to art. His early efforts caused him disappointment. As he wrote to Sidney Janis, “It seems that my mind knew well what I wanted to portray, but my hands were unable to produce what my mind demanded.” Nevertheless, in 1939 two of Hirshfield’s paintings were selected to be included in a private exhibition of “Unknowns” at the Museum of Modern Art. In 1943, he was given a one-man show at the Museum of Modern Art that caused a great deal of controversy. The Art Digest sardonically dubbed Hirshfield, “The Master of the Two Left Feet.” Yet, Hirshfield weathered the storm of controversy and emerged as one of the most prominent folk artists of the century. Several of his paintings are in the permanent collection of the Museum of Modern Art, and he has been included in exhibitions at the Art of this Century Gallery, the Musée de l’Art Moderne in Paris and in almost every major survey of folk art around the world.